So there's slack and there's slack. Scott's Redgauntlet (1824) doesn't really get moving until, in my Oxford World's Classic edition, p. 262. * But once it does, it goes to some interesting places. 'And what may that be?' said Fairford. It's maybe only a chapter and a half where Nanty Ewart takes over, but it's one of Scott's finest pieces. Almost all of it could have been eliminated if all Scott wanted to do nothing but push the story forward. Redgauntlet is probably a terrible "first Scott". The preceding Waverley, Old Mortality, The Black Dwarf, and Rob Roy all deal with Scottish rebellions against English rule, scattered over 150 years. Redgauntlet serves as a sort of sequel. It's 1765, twenty years after the Rebellion of 1745, and the Jacobins are going to raise the call to arms one more time. But it's too late. In all of the earlier rebellions, the Scots had at least a chance of success. In Redgauntlet, the cause is lost. This is really what much of the novel is about - the discovery by honorable men that the cause to which they have devoted their lives is lost forever. The emotional effect of this theme has to be stronger for a reader who has, like the title character, been here before. Honor and loyalty - Scott returns to this theme repeatedly. Perhaps one reason we do not read Scott so much now is that our ideas about honor have changed too much since Scott's time. * Aside from "Wandering Willie's Tale." Letter XI contains a first-rate ghost story, complete in itself, and worth reading for its own sake. Ford Madox Ford on "the amateur literary hack" Walter Scott: "His literary merits are almost undiscoverable," and "We are no longer inclined to sit four hours over a book before the author will deign to give us some idea of what his story is." See The March of Literature, pp. 711-13 for more. Ford explicitly compares Scott to Flaubert, which will not get us very far with very many pre-Flaubert novels - let's leave that topic for another time. In 13 Ways of Looking at the Novel, Jane Smiley singles out and recommends The Heart of Midlothian and The Bride of Lammermoor. Unfortunately, I don't remember why. The Bride of Lammermoor is a solid novel of thwarted love, with a good semi-Dickensian comic relief character who I find funny and an especially good climax. It's also short, for a Scott novel - 330 pages in the Penguin Classics edition. So far, so good. What's the problem? The novel forms the basis for Donizetti's bel canto opera, Lucia di Lammermoor. Lucia is a silly piece of work, in general, but it has one unbelievable scene, the main reason the opera is still performed (besides the popular sextet). The heroine is married against her will and goes mad. Her mad scene, amongst the wedding guests, is one of the greatest in opera history, several arias blended into a perfect twenty or thirty minutes. Ravishing, powerful, and such words. Ahead of its time. Here's the thing. Lucia di Lammermoor is typically long, about two and a half hours. Opera-goers are patient folk, happily waiting for the choice bits. How much of The Bride of Lammermoor does the opera include? The last thirty pages. Of 330. Less than ten percent. The first 300 pages are squashed into the minimal exposition, or ignored. Here's something I won't say very often: the librettist was right, completely right (hats off to Salvatore Cammarano). The real story of the novel doesn't get moving until the very end. The rest is filler, sometimes engaging, sometimes not. Maybe the novel couldn't function at all if it were trimmed down. But 300 pages to get to the good part - that's a lot to ask of a reader. This hardly means The Bride of Lammermoor is not worth reading. You might agree with Jane Smiley rather than with me, and I'm glad I read it myself. But it would take special pleading to get me to reread it. I count 27 Walter Scott novels in at the Edinburgh University Walter Scott archive, plus several best-selling book-length poems, and a life of Napoleon. Complete sets of Scott were once common in elegant U.S. households. By "once", I mean a hundred years ago, or more. Nobody reads all of these novels now. Penguin Classics and Oxford World Classics have a total of nine Scott books in print now - Ivanhoe, Rob Roy, and seven less famous novels (where's Redgauntlet?). This tells you which books people are teaching. Who reads Scott anymore, Prof. Novel Reading wants to know (she does - teaches him, too). She's responding to a 1997 article by Brian Nellist that cleverly draws it's title from To the Lighthouse, called "People Don't Read Scott Anymore". Nellist in turn is implicitly responding to the classic Irving Howe essay "Falling Out of the Canon: The Strange Fate of Walter Scott" (The New Republic, 1992) . My favorite Scott novel, of the six I've read, is Old Mortality (1816), a novel about the violent religious conflicts in 17th century Scotland. It's thoughtfully constructed, funny here, serious there, and the ending is plausible, sometimes a weakness with Scott. The two battle scenes are excellent, even better than those in Waverley, although they're not Stendhal, or Tolstoy. The novel is about, among other things, politics and religious fundamentalism, and I'll bet it's partly taught for just that reason, it's "relevance". As much as I admire Old Mortality, though, I'll bet that The Heart of Midlothian (1818) impresses more readers. The title refers to the prison in the center of Edinburgh, which at the beginning of the novel houses Effie Deans, imprisoned for the presumed murder of her missing illegitimate infant. The heart of the novel concerns the heroic efforts of Jeanie Deans to save her sister. I am not completely sure what people mean when they say a character is "strong", but I think they mean someone like Jeanie Deans, honest, stubborn, who will do anything honorable to save her sister. The Heart of Midlothian begins with a trick. The first quarter or so of the novel is about a mob attack on the prison, and the main character is Jeanie's fiancé, who it seems will be the hero of the novel. But no, when the central action gets going, he proves to be useless. It's really Jeannie's story. Scott was formulaic in some ways, but he was always playing around with his stories' structures. 'Tell me, thou bonny bird. I have known at least one Professional Reader to give up on The Heart of Midlothian, put off by Scott's abiding weakness. The word that Scott can't escape is "slack". Rarely is he in a hurry to get anywhere, so he requires patience, perhaps too much at times. The story of The Heart of Midlothian is not told with anything resembling efficiency. Tomorrow I think I'll look at a worse offender. Now here's a good idea. The Little Professor regularly posts her book acquisitions, but recently also posted a wish list. If you have any of the books on her list, send them her way. Someday, they will be part of some lucky university library's Little Professor Collection of Unreadable Victorian Protestant Novels and Supporting Materials. My wish list consists solely of books that do not exist but could. I don't mean lost books - Ovid's Medea, or the Collected Poems of Sappho. That's a different list. These are the books I would like someone to translate for me. Robert Garnier, Les Juives (The Jewesses) (1583) - Garnier is the 16th century creator of classical French tragedy. This is not exactly a favorite genre, but I have read Mary Sidney's translation of his play on Anthony and Cleopatra (Marc-Antoine, 1578, tr. as The Tragedie of Antonie, 1592), and would like to learn more. Agrippa d'Aubigné, Les Tragiques (1616) - a complicated epic poem that I am unlikely to understand without extensive notes. Translator, please include extensive notes. Alfred de Vigny, Selected Poems - the few de Vigny poems I have found in English are lovely things. More please. A collection of Alfred de Musset would also be welcome, although libraries sometimes have a complete translation of his work from the early 20th century. Théophile Gautier, Enamels and Cameos (1852) - Gautier is the author of the cross-dressing Lesbian travesty novel Mademoiselle de Maupin (1835), which is commonly available, but his poems are not, despite the attention paid to contemporaries like Baudelaire and Verlaine. Surely Gautier is no more difficult to translate than those fellows. Ugo Foscolo, Odes and Graces, or how about a collected poems - the great Italian Romantic poet and novelist. I found a few of these on the internet somewhere, and want more - all. E.T.A. Hoffmann, Complete Works - Penguin Classics and Oxford World Classics have kept good selections of Hoffmann's stories in print, and one can scrounge up a dozen or so more in various other collections. But Hoffmann is a major figure who should be available in English in his entirety. Theodor Storm, Poems - some of his tales are available here and there, but not the poems. Johann Peter Hebel, The Rhineland House-Friend, or whatever it's English title should be. A collection of humorous tales and anecdotes in the form of an almanac, sort of. Fragments I've read are excellent. I could go on and on with the Germans, but I have indulged myself enough already. I would love to be wrong about the availability of these works. Please let me know if I am. Also, let me know what's missing from my list - fill out this agenda for translators. Who alone is all things in one. From Matthew Arnold's "Heine's Grave"
What to make of those lines of Arnold's? Not exactly in the spirit of the Heine poems I've been looking at all week, are they? Heine spent the last seven or eight years of his life confined to bed, in severe pain, partly blind, victim of a degenerative illness. "The mattress-grave," he called it. I haven't read the poems from this period. Reading his autobiographical writing from this time, charming but sharp, mostly about his childhood, you (I) would never guess that he was so sick. With nothing but joy and pleasure. It means divorce - that tears it! Poem 72 of The Homecoming. That was Heine! Sol Liptzin, The English Legend of Heinrich Heine (1954), has been very instructive on this subject. * And our use of the word "Philistine" comes from Heine, through an essay of Arnold's. “James Thomson, the author of The City of Dreadful Night, wrote a lengthy article commending Arnold but expressing the belief that the latter had no need to introduce the terms Philistine and Philistinism from German. Thomson suggested popularizing the expressions Bumble, Bumbledom, Bumbleism.” (Liptzin, p. 79) Hats off to James Thomson! Heinrich Heine had a sharp tongue. He found himself banned from Germany - from Prussia, really - for his political writing, and spent the last 25 years of his life in exile in Paris, which was less fun than it sounds. Heine's early reputation in England was that of a nihilistic, radical atheist, a blend of the most dangerous elements of Byron and Shelley. How this was pulled even from his satirical writings is not clear to me. Thomas Carlyle described Heine as "(redacted anti-Semitic slur) - fit only to eat sausages made of toads. "* In fairness to Carlyle, at the time he said this he was not only loathsome, but, as the English say, starkers. Rotten cabbage plus Russian leather. This is from Caput 26, p. 532 of the Hal Draper Complete Poems of Heinrich Heine. I do not believe that it requires much interpretive comment. Oh, the vanity of artists! Were dispalyed before the public. The gavotte, his favorite measure. Prancing strangely in the moonlight. Here are two other translations of the marvelous Atta Troll: from Google books, a 1914 version, complete with illustrations and the scanner's thumb, and a more recent attempt. * Quoted in Sol Liptzin's The English Legend of Heinrich Heine (1954). Or with love is he demented? So cast down yet so contented." And, besides that, he's a poet!" I was planning to move on to Heine's satirical poems, but I am enjoying the lyrics too much. This one at least has a joke at Heine's own expense. I don't have the German handy, so I have no idea what Louis Untermeyer may have done here - my guess is the translation is pretty free. The metaphors are all simple, excellent examples of the pathetic fallacy: night's "silent footsteps", the waves' "curious whispers", the moon's "shining laughter." A lovely poem, and a good joke. A wife that was young and gay! Of that queen so young and fair. So sweet, so sad to tell? Because they loved too well. I especially like Heine's refusal to tell the story. You already know it. Poetry can get away with this. All tranlsations so far have been from The Poetry and Prose of Heinrich Heine (1948), edited by Frerick Ewen, which uses a variety of translators. The fires of love awakened. Of how my heart was aching. Why, it's May right now. This poem is almost relevant. That's the whole poem, another one from the 1820s. If you can pronounce German, in the first line, italicized above, you can hear why so many songs were built on Heine lyrics. Seven vowel sounds in eight syllables. * Aaron Kramer's translation also sounds like a song, but a quite different one. And hand in trembling hand. We did not sigh nor moan. In which to weep alone. This one may verge on the ridiculous. In some ways, Heine occupies a place in German comparable to Keats or Shelley in English, but I'm not sure either of those two, or anyone else, was such a prolific source of this kind of brief lyric poem, where the bittersweet substance of it just barely exists. Not pure music, but close. Heine wrote a heap of poems like this, but it's hardly his only mode. Tomorrow, a look at the acid-tongued Heine. * Hear how the types of vowel sound alternate in the German: i/u/e/ö/e/o/a/ai. The English can't replicate this, but can at least keep all of the "m"s.
Here lived a lass who was dear to me. Bu here is her house, as it used to be. And wrings his hands in a storm of pain. It is my own self the moon shows plain. You double! You comrade ghostly white! Under these windows - long ago? A horrible moment of self-awareness? A memory, or an event? Does the poet see himself, or his double, in a vision, or in a reflection in a window? Is "a storm of pain" an adequate translation of "Schmerzensgewalt"? How could it be? I'll spend the rest of the week with Heine. Maybe at some point I'll not only ask a question, but answer it. A couple of thank yous, first to Nigel Beale at Nota Bene for hosting the Hamlet book chat last week. It was a great deal of fun for me, and I hope we can organize another one. Second, thanks to the indefatigable, all-seeing Brontë blog, which linked to all of my Jane Eyre pieces last week. With any luck, I'll take a run at Wuthering Heights and Emily's poetry later in the year. I have been writing about a book called Jane Eyre, written by Charlotte Brontë, published in 1847. The original title page did not have Brontë’s name on it. Jane Eyre: An Autobiography, Edited by Currer Bell. In the world of Brontë’s Jane Eyre, there exists this other book, Jane Eyre: An Autobiography, written, obviously, by Jane Eyre. In the world of the novel, why was this book published? Why was it written? In 1847, Jane is 58, and Rochester is – how old is Rochester? – 75, at least, maybe as old as 80. Perhaps the publication of Jane Eyre signals his decease. Perhaps they have both died. Why does Jane write the book? One reason not to: it makes her beloved husband look pathetic, criminal, lunatic, perhaps worse. But that suggests a possibility: revenge. Jane calmly, systematically destroys all of the men who wanted to destroy her: Mr. Brocklehurst, her cousin John Reed, and, most of all, her cousin St. John, the only man who almost defeated her. Perhaps that’s why the last two paragraphs of the book are entirely about him. Revenge on Rochester? I’m not willing to make that case. Rochester is such a perverse, peculiar fellow that I imagine him actively enjoying the worst that Jane could write about him, even encouraging her. This is one reason they’re such a lovely couple. The voice of the narrator is not the voice of the character. The narrator is calmer, more rational. She’s channeled some of the wildness of her imagination. Channeled into what? Into an emotionally rich marriage, and into Jane Eyre: An Autobiography. This tension between young Jane and narrator Jane is one of the most interesting things in the book. I don’t understand this aspect of the book well enough to write about it now. When I reread, it's one thing I’ll look for. The narrative voice harkens back to Defoe, and Pamela – the references to 18th century books are not coincidental – but creates something new, and more sophisticated. None of her predecessors were quite like her, nor her contemporaries. Dickens wrote seven novels before trying the first person in David Copperfield, published a few years after Jane Eyre. Brontë knew what to do with it right away. So many more ideas in the book. I’ve barely scratched Brontë’s prose, which, besides the quality of the voice, includes some lovely metaphorical language (“the little brown birds, which stirred occasionally in the hedge, looked like single russet leaves that had forgotten to drop,” Ch. 12), and only a few real clinkers, mostly in dialogue. Some readers of Jane Eyre may think I've skipped the heart of the book - Jane and Rochester, should Jane do this or that, and so on. Ethical aspects of the novel. Maybe so. But I think the ethics cannot be correctly understood without also studying the art of the novel, so that's what I usually try to write about. Charlotte Brontë was a literary artist of high caliber. Seems strange to me not to treat her as such. Jane Eyre is split into four main sections, each one featuring a powerful man who wants to crush her. Why does every man she meets feel compelled to do this? Jane is so nice. That “no one ever taught me” is a tip-off. Helen is an exponent of natural religion, the personal combination of reason and scripture. But see the passage a little earlier, where Helen can’t answer a question in class because she is “listening to the visionary brook,” like a little Henry David Thoreau. So Helen is also restlessly imaginative. And ornery. So is Jane. Helen is in some ways a more mature version of Jane Eyre, a model for Jane’s future growth. Poor Helen – “I heard frequently the sound of a hollow cough” (Ch. 5, 42). That’s actually our introduction to Helen – Jane doesn’t even see her for another two paragraphs. The cough comes first. Readers of Victorian novels know what that means. Poor Helen. Her death scene has true pathos. Note the passive voice in the passage about Helen’s gravestone: “for fifteen years after her death it was only covered by a grassy mound; but now a grey marble tablet marks the spot” (Ch. 9, 72). The tablet was, of course, placed by Jane Fairfax, in 1816 or so, soon after her return from her Continental honeymoon. Jane again encounters her cousins in this section, one a shallow idiot, one about to enter a Catholic convent. Cousin Eliza is almost a photonegative of Helen Burns, isn’t she, religious to the point of fanaticism, self-controlled to the point of suppression of human feeling? Another example for Jane’s growth – how not to be. So I had known that Jane becomes a governess in the hire of a Romantic hero with a terrible secret. I hadn’t known that this Byronic man of action is convinced Jane is a fairy. The stream of references to fairies and their kin is constant in Jane Eyre, from the first meeting of Jane and Rochester, all the way to the end. When they meet, Jane thinks of “a North-of-England spirit,” and Rochester soon after says that he also “thought unaccountably of fairy tales” (Ch. 13, 107). That’s during the strange, hilarious first conversation between Jane and Rochester, when he directly asks her if she was waiting for “the men in green,” and Jane answers in all seriousness that “The men in green forsook England a hundred years ago.” Poor Mrs. Fairfax “dropped her knitting... wondering what sort of talk this was.” Good question, Mrs. Fairfax. Rochester never stops talking this way. That’s the key – it’s just Rochester. He calls Jane an elf, a sprite, a salamander. He calls himself an ogre and a ghoul. Jane doesn’t talk like this. Part of this is banter, part of it is self-concealment. Still. He can’t stop himself. Or Jane-the-narrator doesn’t let him – she’s the one telling the story. A couple of red herrings are thrown in. Jane mentions Bluebeard in just the right spot (Ch. 11, 93) , although much too early for the first-time reader to understand it, so that’s really just Jane-the-narrator having her fun. The occasional reference to “the Vampyre” belongs in the “Gothic parody” box, not with the fairy stuff. Every great writer creates fantasy worlds, our world seen through a creative prism, the best realists as much as the pure fantasists. In a so-called realistic novel, the reader typically accepts one major improbability, the possible but unlikely thing that generates the novel. Rochester is keeping a m*d*o*a*n in the a*t*c. Unlikely, though not impossible, and anyone who runs into such a thing, should write a book about it. But the story of Jane Eyre has a second, completely coincidental, grosser improbability. Jane flees Rochester and lands amongst the least likely people in the entire world for her to meet. Isn’t this a terrible strain on the story? Jane finds herself at a literal crossroads at the beginning of Chapter 28, in one of those odd passages where she switches to the present tense (“I am alone... I discover... I am absolutely destitute”). She doesn’t know where any of the four roads leads, or have any reason to take one over the other. Level-headed Jane surprises us all by picking path number five, not a path at all – she heads “straight into the heath”, which turns out to lead, on the third night of wandering, directly to her fairy family. To whom else would it lead? Put this way, it’s all perfectly logical. She finds her fairy cousins are teaching themselves German by means of Schiller’s The Robbers (1781), another 18th century book, and what that means, I have no clue. Maybe Brontë thought having them read the Brothers Grimm would be too blatant. The same story can be told in endlessly different ways – characters, incident, and setting can be varied, but also style and imagery. It's those latter that distinguish the great work of art. There’s one 19th century book in Jane Eyre, Walter Scott’s long poem Marmion (1808), “a new publication” (Ch. 32, 326)*. It’s autumn; Jane is teaching in the country school. Autumn 1808. Suddenly, for those paying attention, the entire chronology snaps into place. This is the first and only detail that allows a precise determination of the chronology of Jane Eyre. Jane, now 19 (that summer she was “almost 19”, Ch. 29, 305), was born in 1789. Chapter 1 takes place in the winter of 1800 when Jane is ten. The main action takes place from 1807 to 1809, at which point Jane is married. Jane says she is writing the book ten years later (Ch. 38, 396), so that’s 1819, when she is 29 or 30. That’s also Charlotte Brontë’s age while writing Jane Eyre, although Jane is, of course, 27 years older than Brontë. Jane would be 58 or so at the time of Jane Eyre’s publication in 1847. Let’s save that idea. “Twenty years ago, a poor curate--never mind his name at this moment—fell in love with a rich man's daughter; she fell in love with him, and married him, against the advice of all her friends, who consequently disowned her immediately after the wedding. Before two years passed, the rash pair were both dead, and laid quietly side by side under one slab. (I have seen their grave; it formed part of the pavement of a huge churchyard surrounding the grim, soot-black old cathedral of an overgrown manufacturing town in ---shire.) They left a daughter, which, at its very birth, Charity received in her lap--cold as that of the snow-drift I almost stuck fast in to-night.” And onward to the novel's present moment. Seen their grave, have you, St. John? Odd bird. Anyway, Brontë knew just what she was doing. We're in good hands here. So let's see - when Rochester is having his fling with the French actress, it is perhaps 1796, just after the terror and before Napoleon’s coup. When Rochester asks Jane to flee with him to the south of France, it is 1808, France and England have been at war for a decade, and the whole scheme seems extremely unlikely. Perhaps this tells us something about Rochester, that he’s not serious, or that he’s serious but unrealistic. Perhaps it is an error on Brontë’s part. Or perhaps the world of Jane Eyre is different than the historical world on a few key points. That, I think, I’ll save for tomorrow. * Marmion is “one of those genuine productions so often vouchsafed to the fortunate public of those days—the golden age of modern literature. Alas! the readers of our era are less favoured. But courage!” And so on, for quite a while. Weird passage. What on earth is Jane, or Charlotte, talking about? A while ago, I used Jane Eyre as an example of a book where somehow, without reading it, I already knew the story. Now I’ve read it. All week: what I didn’t know. “I returned to my book – Bewick’s ‘History of British Birds’: the letterpress thereof I cared little for, generally speaking; and yet there were certain introductory pages that, child as I was, I could not pass quite as a blank. They were those which treat of the haunts of the sea-fowl...” (Ch 1, p. 6). “The two ships becalmed on a torpid sea I believed to be marine phantoms. The fiend pinning down the thief’s pack behind him I passed over quickly: it was an object of terror. On the next page, our narrator Jane (not the ten year-old Jane) mentions Richardson’s Pamela (1740) and John Wesley’s Henry, Earl of Moreland (1781), as well as “old fairy tales and older ballads”. A page later, there’s Oliver Goldsmith’s History of Rome. In Chapter 3, we have a long passage about Gulliver’s Travels. “’I like Revelations, and the book of Daniel, and Genesis and Samuel, and a little bit of Exodus, and some parts of Kings and Chronicles, and Job and Jonah’,” but not the Pslams, because “’Psalms are not interesting,’ I remarked.” (Ch, 4, p. 28) Spot on, Jane! Almost all of these books of the Bible, by the way, have some relation to later events in the story. Jane meets the key figure of Helen Burns (more on her later) while Helen is reading Johnson’s Rasselas (1759). Jane thinks it “looked dull to my trifling taste: I saw nothing about fairies, nothing about genii; no bright variety seemed spread over the closely printed pages.” (Ch 5, p. 43) Jane scores again! Note that not a single book is from the 19th century. It turns out this is a clue, and in fact the single appearance of a 19th century book, late in the novel, snaps the whole chronology into place. But there’s something else going on here. One thing books are made of is other books. The plot and incidents of Jane Eyre contain specific parallels to The Old Curiosity Shop, Nicholas Nickleby, and, most obviously, Oliver Twist. There is also a strong strain of anti-Gothic parody, invoking Northanger Abbey, and the long party scene has more than a little Austen in it. But Jane Eyre isn’t really closely related or influenced by any of these books or writers (maybe by Austen, a bit). The intellectual background of the story, of the character, lies completely in the 18th century. The Gothic novels of Ann Radcliffe and many others, the preyed-upon but ultimately triumphant maid of Pamela, the telepathy scene, directly borrowed from Defoe’s Moll Flanders. None of this makes Jane Eyre unoriginal; quite the contrary. Books are made of other books. It’s all ingeniously blended together in Charlotte Brontë’s own unique mind to make something entirely new. What does she make? More on Jane Eyre, all week. All references to the Norton Critical Edition. This afternoon Ruskin gave us a great outburst against modern times. He had got a picture of Turner's, framed and glassed, representing Leicester and the Abbey in the distance at sunset, over a river. He read the account of Wolsey's death out of Henry VIII. Then he pointed to the picture as representing Leicester when Turner had drawn it. Then he said, "You, if you like, may go to Leicester to see what it is like now. I never shall. But I can make a pretty good guess." Then he caught up a paintbrush. "These stepping-stones of course have been done away with, and are replaced by a be-au-ti-ful iron bridge." Then he dashed in the iron bridge on the glass of the picture. "The colour of the stream is supplied on one side by the indigo factory." Forthwith one side of the stream became indigo. "On the other side by the soap factory." Soap dashed in. "They mix in the middle — like curds," he said, working them together with a sort of malicious deliberation. "This field, over which you see the sun setting behind the abbey, is not occupied in a proper manner." Then there went a flame of scarlet across the picture, which developed itself into windows and roofs and red brick, and rushed up into a chimney. "The atmosphere is supplied — thus!" A puff and cloud of smoke all over Turner's sky: and then the brush thrown down, and Ruskin confronting modern civilisation amidst a tempest of applause, which he always elicits now, as he has this term become immensely popular, his lectures being crowded, whereas of old he used to prophesy to empty benches. I added the paragraphing. I could only find a print based on the Leicester Abbey watercolor. No other comment necessary. 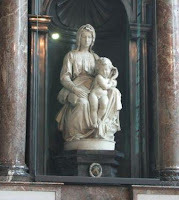 "The other day at Bruges, while I was endeavoring to set down in my note-book something of the ineffable expression of the Madonna in the Cathedral, a French amateur came up to me, to inquire if I had seen the modern French pictures in a neighboring church. I had not, but felt little inclined to leave my marble for all the canvas that ever suffered from French brushes. My apathy was attacked with gradually increasing energy of praise. Rubens never executed - Titian never coloured anything like them. I thought this highly probable, and still sat quiet." John Ruskin, Modern Painters, I.I.v, "Of Ideas of Truth"
Well, I think it's funny. Ruskin's comic relief certainly helps a person move through Modern Painters. I don't want to exaggerate - there may be a joke every 20 pages or so. The long sections "On Leaf Beauty" and "On Cloud Beauty" may be hilarious, but I'm not counting on it. Still, a joke here and there beats none at all. All art constantly aspires towards the condition of music - you don't say! Walter Pater tells us, in the "School of Giorgione" chapter of The Renaissance (1873), that "All art aspires towards the condition of music." Later, in the conclusion, one can find his geniuses burning with their "hard gemlike flame." One advantage of specializing in a period is that one can, through repeated exposure, begin to make sense of nonsense like this. * I mean insights, one can make sense of these deep insights. I have obviously not reached that point with later 19th century aesthetic theory. This particular ranking of the arts seems to have begun with Schopenhauer. The very abstractness of music allows it a kind of stronger reality than more concrete arts. Something like that. Richard Wagner swallowed the whole thing (when an eminent philosopher says everyone wants to be, and should be, like you, who among us would gainsay him? ), and under his influence so did many others. The idea seems to have been especially strong in France and Germany - it's a major component of French Symbolist poetry, while German novelists created a genre to explore it, the Kunstlerroman. Since I don't understand this stuff, I'll make a simpler point: people, writers, really believed it. This wasn't just intellectual play. Poets, painters, architects, were told that art aspired towards music, and as a result they themselves aspired to create art that was like music. Yesterday I wrote a bit about writers who used other artist characters as surrogates for their ideas about writing, but in this intellectual environment, it would be odd if everyone wrote about artists this way. At a minimum, writers would want to see test their art form against others. What does music do that the novel does not? What can the novel do to be more musical? At a basic level, this is just a set of contrasts. I think this is part of what Marcel Proust is doing with his gallery of artists in In Search of Lost Time. Bergotte the writer, Elstir the painter, Vinteuil the composer (am I forgetting someone?) - these characters allow Proust to knock their art forms up against each other. The little motif of Vinteuil's sonata that runs through the novel, affecting characters in different ways, for example: what is it doing that a written passage can't? Or look at the novelist Bergotte's strange vision of "the tiny patch of yellow wall" in Vermeer's View of Delft. The dying Bergotte says that he should have written his novels like that little patch of wall. What can he mean? I'll try an earlier example, no less difficult. E. T. A. Hoffmann was not just a writer, but a practising composer. His opera Undine (1814) is still performed in Germany. Here's an author whose composer characters, of which there are a few, are surely not mannequin writers. The Life and Opinions of Tomcat Murr (1820-22) presents Hoffmann's divide in an extreme way. The novel abruptly alternates between the autobiography of a cat, written by himself (he's a very talented cat), with a fairy-tale like story of the composer Johannes Kreisler (who is also a person the cat knows). The cat, it turns out, was using the manuscript of the composer's story as blotting paper, so the pages got mixed together. This is a very strange book. I don't know what it means that the cat-author, in the process of writing, mangles the composer's story. Or that the composer lives in a sort of magical world while the author's concerns - plates of cream, pretty lady cats, and the like - are purely quotidian. I'll bet it means something, and it's not that the creative nature of composing and writing are the same. * Older examples: Poetry is painting. Shakespeare holds a mirror up to Nature. When an author writes a story about another artist – a painter, a composer, a choreographer* – what is she really writing about? Recently, I wrote that I always assume that the artist character is really a disguised writer. A little glib, I know, but this is my starting point until convinced otherwise. A novelist who wants to write about the source or character or limits of her own creativity may want to avoid directly writing about another writer. One reason is to appear a bit less narcissistic, another is to create some distance between the author and her subject. A modern, modernist, example: in The Lost Steps (1953) Alejo Carpentier takes a composer from New York City up the Orinoco into the Venezuelan jungle. The composer is struggling with an oratorio based on Shelley’s Prometheus Unbound. The novel is a critique or investigation of Romantic notions of the Primitive. Some people hate being told what a novel is about in such stark terms, and a rich book like The Lost Steps is “about” more than one thing, sure. But, no kidding, Romantic notions of the Primitive – ignore that and you ignore most of the book. If the narrator were a painter or writer or photographer some details would change, possibly in interesting ways, but not the central question. To be clear: I don’t think that Balzac or Carpentier or Gogol are writing about writing as such when they tell these stories (Lost Illusions is Balzac writing about writing as such). They’re writing about creativity. That’s the subject they can displace onto another art form. Tomorrow, the deep end of the pool (and I'm not such a strong swimmer): when the form makes all the difference. Thanks to the Incurable Logophile for the suggestion. Got me thinking. * Half kidding about the choreographer. What are the great novels or stories about choreographers? No idea. Suggestions welcome. ** The Unknown Masterpiece has taken on a life of its own, interpreted by later readers in ways that might shock Balzac. More on that some other time. The title quotation was said, not so long ago, by a distinguished scholar of 17th century English literature. I don't want to go into the context too much, but if you are giving a paper in a graduate seminar and you hear this, you're doing something wrong. I think of this line routinely when writing about old books, or reading about them on other blogs. Meine Frau suggests the metaphor of arriving at a party late and trying to join an ongoing conversation. Perhaps it would be polite to listen a bit before jumping in - maybe someone has already said what you're dying to say. At some point, though, we go ahead and plunge in. By, say, writing a blog post. Perhaps we have acquired some real knowledge, or perhaps our enthusiam just gets the best of us. Reading Jane Eyre, I occasionally stop to puzzle around what or how (or if) I will write about it. People, it turns out, have written about Jane Eyre. My unmediated first reading is full of insights that are new, exciting, and of the highest interest - to me. To you, indulgent reader - we'll see. It's actually much easier to write about the shadowy and obscure. People have written about Thomas Lovell-Beddoes, but hardly to the same degree. My insights are no more original, but somehow the competition is less fierce. Not like Jane Eyre. Not like Hamlet. Beginning Thursday, I think, Nigel Bene will be hosting a discussion of Hamlet in which I will participate. People will be writing about Hamlet. Nigel has invited one and all to stop by. I don't expect to contribute anything especially original, but I do plan to have a good time. Poor Akaky Akakievich. First, his name is ridiculous (it seems to have the same scatological associations in Russian that it does in English, plus it’s a humble saint’s name). Second, he himself is ridiculous. He’s a government clerk, a sort of anti-Bartleby. Akaky is barely more than a human photocopier. He takes copying work home with him because he has no other interests. Poor Akaky. As though he had married! And a dozen other Gogolian delights. Those soldiers and their mustaches are a sort of Gogol specialty. They're not characters in any sense, just a part of the description of the tailor's wife, but Gogol somehow invests them with a little life of their own. The Overcoat is, along with The Nose,* a pinnacle of Gogol’s art. I would be remiss if I failed to point readers to the fine description of The Overcoat at Lizok's Bookshelf. References are to the University of Chicago Press Complete Tales of Nikolai Gogol. * And Dead Souls, and The Government Inspector. Gogol's The Portrait - Was this also a dream? Nikolai Gogol's The Portrait (1842, though there’s an earlier version as well) is about the mysyterious effect of a portrait on two artists. In one case, talent is corrupted, in the other, exalted. Whenever I come across a story about a painter, or composer, or whatnot, I assume that the author is really working out his ideas about writing. It's what Gogol is doing here, anyway. A young, brilliant, impoverished painter buys a strange, compelling portrait. Through an obscure circumstance - a ghost? a prophetic dream? - the portrait leads the artist to a great sum of money. Will it surprise anyone to learn that this leads to new problems? So goes part one. The sequel, or prequel, returns to the beginning but pushes the same ideas to an entirely different conclusion. And that moon returns in the great dream scene. The man in the portrait come to life and reveal a secret. Then that the dream is followed by another dream, and then another - a vertiginous scene. Gogol is writing at a high level here. Was anyone else writing with as sure a hand at this time (early 1840s)? And this isn’t even Gogol at his best – see tomorrow for that.